Is Your Information Protected by a Good Firewall ? 26 Jan Is Your Information Protected by a Good Firewall ? A Good Firewall Makes the Difference! Every serious organization has a local network within the office that is also connected to the biggest of networks: The World Wide Web. While some companies provide Internet access to their employees; some organizations prefer to forbid access altogether. However, every network establishes a connection to the Internet in some way or another. E-mails need to go out; some websites will have to be accessed by employees at some point, etc. Any of these channels represent a “hole” that can be hacked and used to steal data or introduce malicious code into your local network. The bridge between The Internet and your office network is commonly the Internet Modem/Router provided by your Internet Service Provider. These devices can be more or less complex; but they always establish a connection between your local network and the World Wide Web. When one of these devices is smart enough to protect your network and actually block or authorize access to or from it, then it is called a Firewall. The Firewall will deny unauthorized access and allow authorized access depending on a set of established rules. This device or set of devices can be Software based or Hardware base. Hardware firewalls are always preferred by serious network administrators. Hardware firewalls act as small and complex computers with dedicated processor and memory that run highly complex software. The hardware/software combination found in a seriously good Firewall will protect your network and allow it to run smoothly. 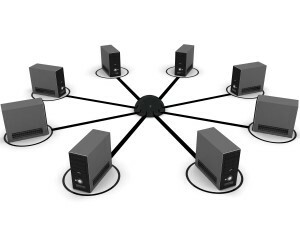 Companies usually host important sets of information and databases. This collection of data is the most important asset of any organization. It moves within the local network but it can also be leaked into the Internet or actually be stolen by malicious hackers. This is where employing good firewalls come into play. They provide network security and actually guard the data by acting as a security guard between your employees and the Internet. This barrier will practically run your network following a set of default as well as customized rules that either allow or deny traffic. Picture it as a group of policemen and traffic lights patrolling the streets and controlling traffic. Websites or different services can be allowed or blocked depending on the business needs. To make things clearer: If any of your employees has access to the Internet, then this means that this person is exposed to hackers that can probe his or her computer for open “holes” in it. If any of these “holes” is open, the hacker can establish illegal connections to the employee’s computer. Once this connection is established, the hacker can “sniff” the network and literally steal your private information, company files, etc. No respectable company leaves their local network exposed to the Internet without a good firewall in between. This is the fastest and most efficient way to protect business privacy and keep it away from criminals. We at Telx are partnered with a leading Firewall manufacturer, SonicWall. We recommend, provide, and support Sonicwall firewalls for all our customers. This Firewall product will protect your network and company information as well as run your network efficiently and securely.